These pictures are from Michelle who was a mellophone player with the Magic in 2005 and Spirit from JSU in 2006. 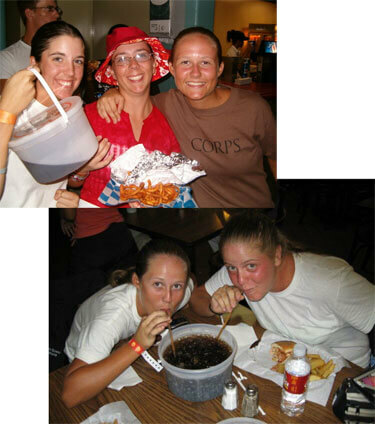 These two pictures are from 2005 and 2006 at the barbeque restaurant across from the Alamodome in San Antonio. For the past two years, my friends and I have broken our soda fasts for the first half of tour at that place by buying the bucket. The next day has always been a free day, so we drank our carbonation (yum, Dr. Pepper!) with no guilt. Top (left to right): Robyn (Capital Regiment 2005, Carolina Crown 2006), Samantha (Colts 2005), and me. Bottom (left to right): Me, Jenn (Kiwanis Kavaliers 2004-2005, Spirit from JSU 2006).